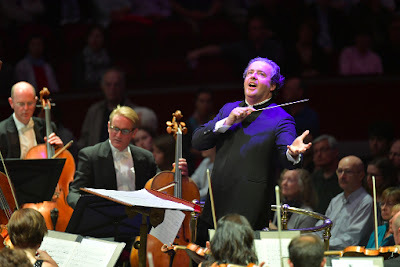 For his final concert as Chief Conductor of the BBC Philharmonic Orchestra, Juanjo Mena chose an interesting mix of British and American 20th century music at the BBC Proms at the Royal Albert Hall on Wednesday 8 August 2018. Mena and the orchestra were joined by soprano Sally Matthews for performances of Benjamin Britten's Les Illuminations and Samuel Barber's Two scenes from 'Antony and Cleopatra', and the programme was completed with William Walton's overture Portsmouth Point, Aaron Copland's Connotations and Britten's Four Sea Interludes from 'Peter Grimes'. The programme included two relative rarities, both the Copland and the Barber receiving their first Proms performance, and the Barber coming hot on the heels of Glyndebourne's new production of his opera Vanessa [see my review] raises interest in his operas even further. But there were other fascinating links in what might at first seem a diverse programme. Both the Barber and Britten's Four Sea Interludes presented music extracted from larger operas, whilst the Barber and the Copland were written for openings at the newly built Lincoln Centre in New York. We started with Walton's Portsmouth Point, his first published work, from the mid-1920s. Mena and the orchestra impressed with their combination of crisp attack and tight rhythms, bringing out the energy and the Stravinskian influences in the work, not to mention the pre-echoes of Facade. Mena's speeds were not too fast, he concentrated on character and rhythm, and there were dancing moments too. After this came the first rarity of the evening, Aaron Copland's Connotations which was written for the New York Philharmonic Orchestra's inaugural concert in the Lincoln Centre in 1962, when the work was conducted by Leonard Bernstein. For the piece, Copland used his own rather idiosyncratic take on serialism and he produced a supremely uncompromising work which effectively creates a set of five variations based on the opening material. This opening material, with its strong and almost strident fanfares and dense chords, made for striking material but hardly rendered the work joyfully celebratory, or easy listening. There was a strong sense of formal structure about the work and, though Copland's ear for harmony and texture was to the fore, his use of serialist techniques gave it a sense of real sobriety. There were five sections, by turns rhythmic and spiky and lyrical with the more lyrical sections including some magically transparent scoring. As with the Walton, the orchestra's sense of crisp and tight rhythm impressed greatly bringing energy and excitement to Copland's sober textures. The first half was completed with Britten's Rimbaud setting, Les Illuminations, which premiered in 1940. The cycle has always been sung by men and by women, the premiere of the work was given in London by the soprano Sophie Wyss whilst Britten conducted Peter Pears in the American premiere. Here we were joined by soprano Sally Matthews, who sang with lovely firm even tone and a careful attention to both words and emotions. Hers was a very vividly emotive performance, with a great use of body language and a very persuasive style. Unfortunately the acoustic of the Royal Albert Hall somewhat defeated her and we needed recourse to the printed programme to follow the words. The opening movements were full of tight rhythms and vivid excitement from the orchestra, complementing the excitement that Matthews brought to the text. Later movements created some lovely, atmospheric string textures surrounding Matthews' luxuriant (almost Straussian) vocal, all performed with great presence and some lovely floated lines. But perky and infectious rhythms were rarely far away. The penultimate movement had a strong sense of steady progression, the parade moving towards its end yet with a disturbing undertow, whilst the final one evaporated beautifully. After the interval Matthews returned, in a glittering gold frock which was very apt for Cleopatra, to sing the two arias which Samuel Barber extracted from his opera Antony and Cleopatra. The work was written for the opening of the new Metropolitan Opera House in the Lincoln Centre. As it happens, Franco Zeffirelli's over elaborate production rather torpedoed Barber's opera and, though Barber revised it and there were further productions, the opera has never been able to quite shake off the reputation acquired from this failed premiere. The original Cleopatra was Leontyne Price who recorded the two arias (her only studio recording of material from the opera). After a stormy orchestral introduction, the first scene gave us a lyrical narrative solo line surrounded by an orchestral halo. Matthews was in luxuriant voice and, thanks to Barber's sympathetic orchestral writing, easily soared over the orchestra, yet the orchestration was still full of marvellous colours. For the second scene, things got even more evocative and moody as Cleopatra prepares for death. The ending was freely rhapsodic with the final section rising to lyrical passion. Antony and Cleopatra remains an opera which I remain very curious about, and this taster certainly whetted my appetite. Sally Matthews clearly loves the music and it suits her, making you wonder whether someone ought to perform it in full with her. Mena and the orchestra supported her finely, whilst relishing Barber's gorgeously rich writing in the orchestral interludes. I have to confess that I rather felt Britten's shade looking over my shoulder and tutting at the romantic opulence of the Barber. His Four Sea Interludes are written with such magical economy and an ear for colour and texture, whilst preserving a certain coolness and evoking the austerity of the East Anglian landscape. Mena's performance with the BBC Philharmonic was full of vivid contrasts, both in terms of dynamics and textures, bringing out the richness of Britten's orchestral detail and again giving us some finely crisp rhythms. The concert was very warmly received, and at the end Juanjo Mena went round thanking each section of the orchestra.